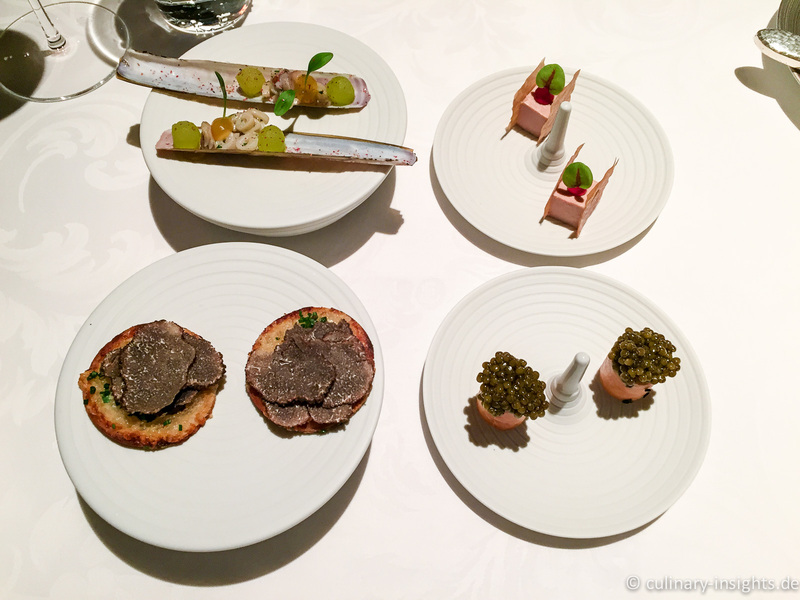 There is proven dramaturgy – a nice start with some apes to accompany a nice glas of champagne, classic and admittently very yummy, especially the “toast” with truffles and the small cylinder filled with eel and topped with caviar. Yes, Erfort still uses these ‘luxury’ products but not to impress but to celebrate them (9/10). 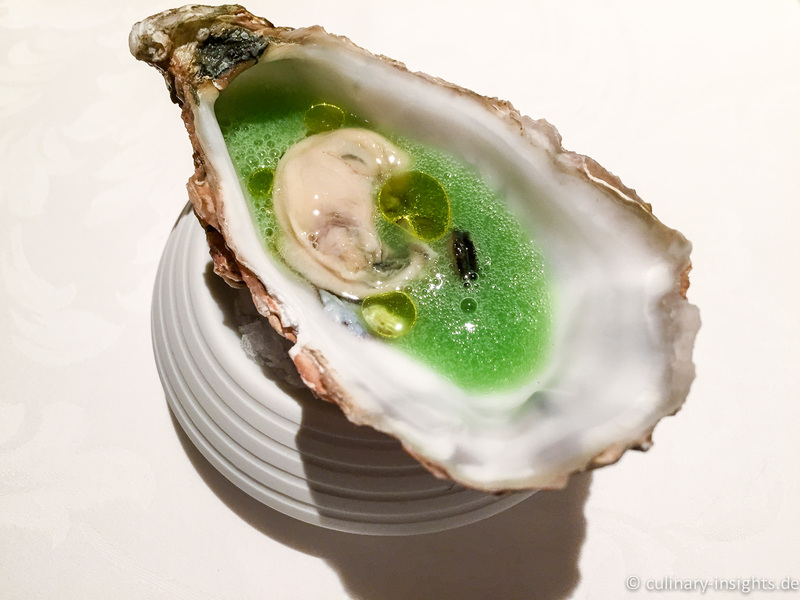 A small oyster was next – yummy, salty, but not overlay intense (9/10)! 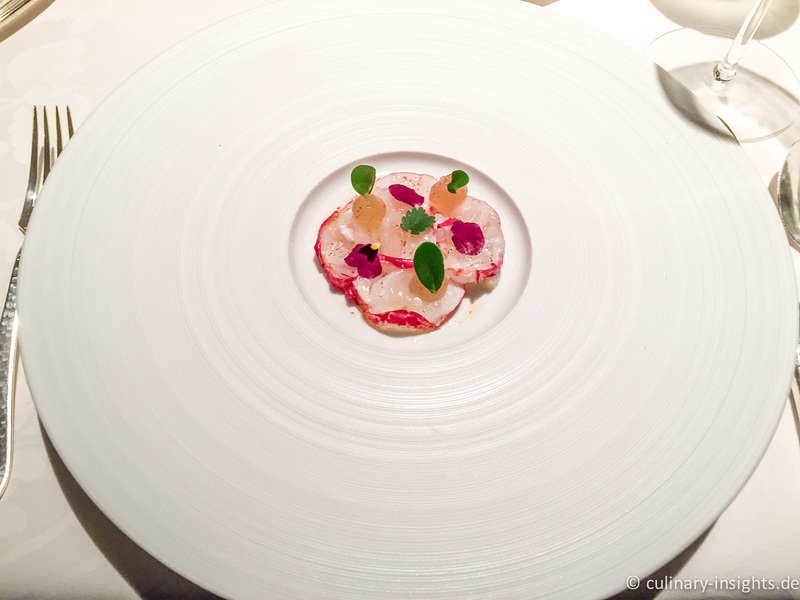 The next amuse – marinated lobster with yuzu was a bit of pre-opener for the first course: the lobster was impeccably cooked and the yes was well intertwined. Excellent (9/10)! Then the first course – basically foie gras layered with thinly sliced scallops and again, a yes marinade but this time too strong and acidic to be enjoyed overpowering the subtle foie-scallop combination completely (6/10). 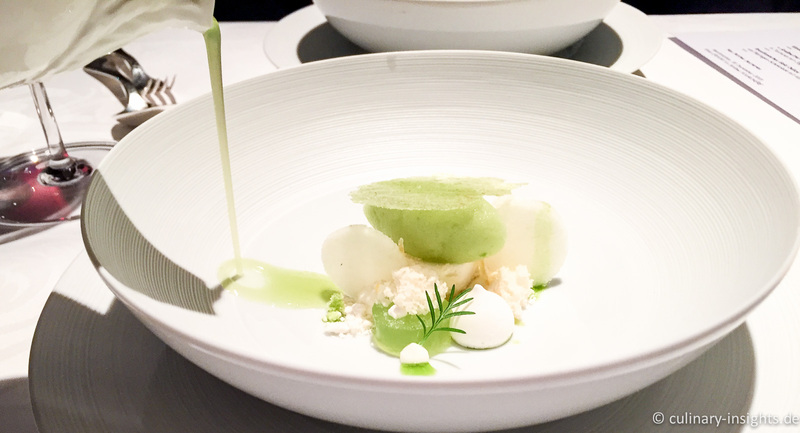 The second course showed what Erfort can do if you concentrates on the essentials – the product in its very best form. 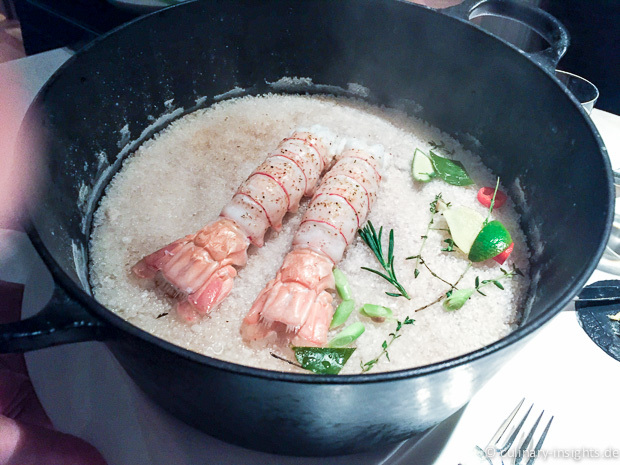 Superb langoustine were cooked on sea salt to perfection, tender and delicate. 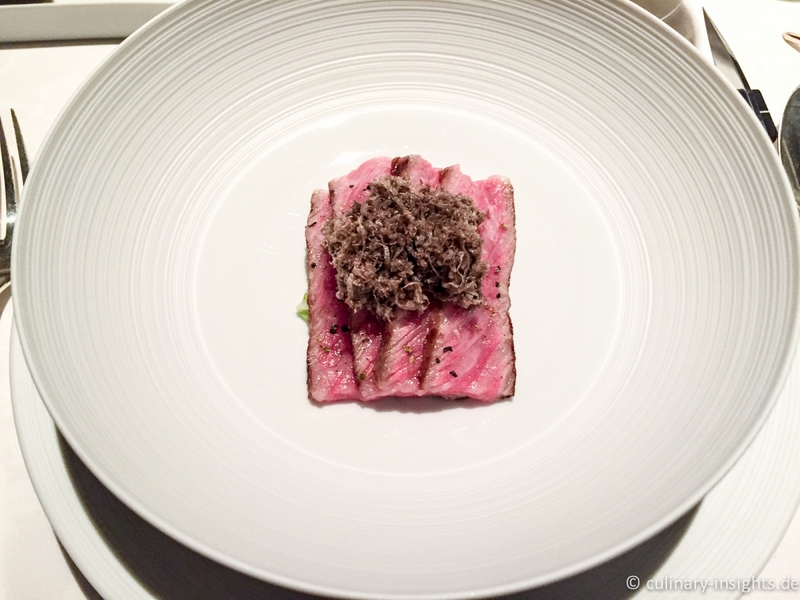 Metro Pourchère presented them in the pot table-side and then plated them just on some small young leeks and garnished with some but not too much Alba truffles jus. Devine (10/10)! 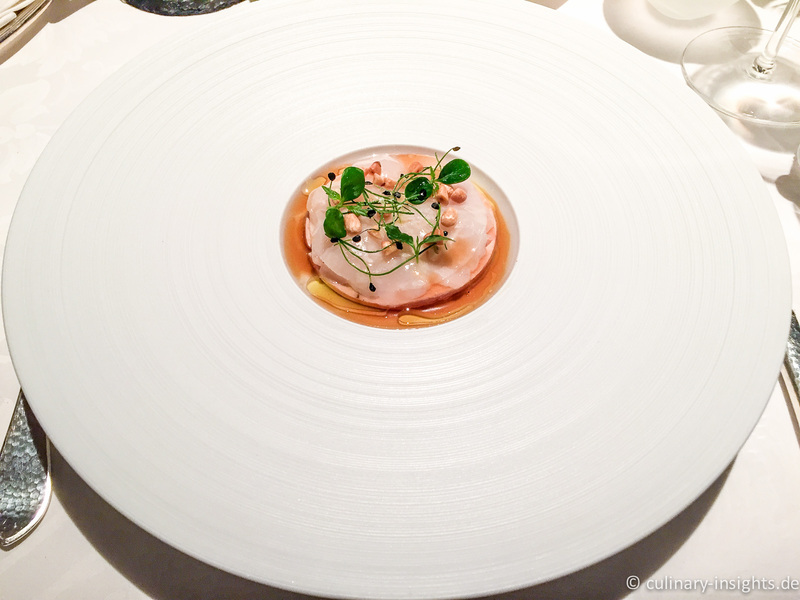 Turbot had always been a specialty of Klaus Erfort – and it didn’t not disappoint this time either. Cut from a huge 5+ turbot this thick species was incredibly juicy, perfectly cooked and intrinsically delicate. 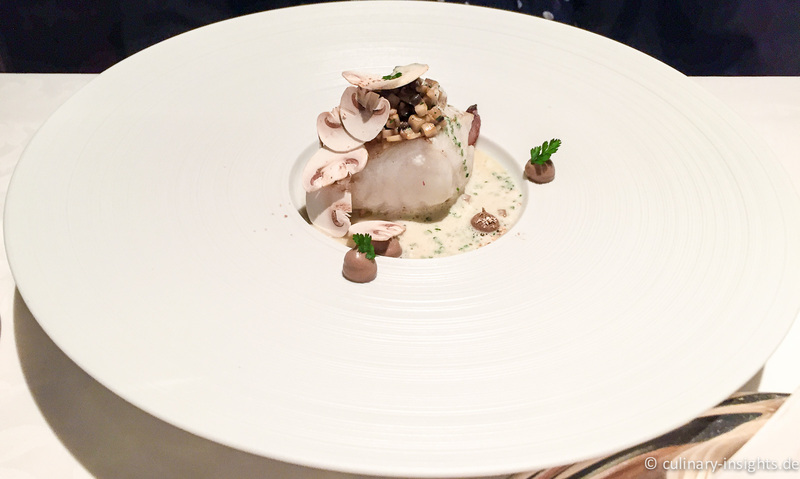 The ‘garnish’ of mushrooms in different textures emphasized different aspect of the fish – another absolutely divine dish (10/10)! The following crossly roasted pork tail was another masterpiece – crisp on the outside, the meat on the inside was incredibly tender, juicy, and of benchmark pork character, very authentic. The idea then to fill it with trumpet mushrooms and serve it with some broad beans, ginger/chili sugo, black garlic and an eggplant compote was just fantastic, especially the interplay of spiciness and the textural overlay whereas both eggplant and beans were pleasant neutralizers (10/10). After these absolute heights the first dessert provided some cooling down with a nice variation on apples – perfectly positioned and yummy (10/10). 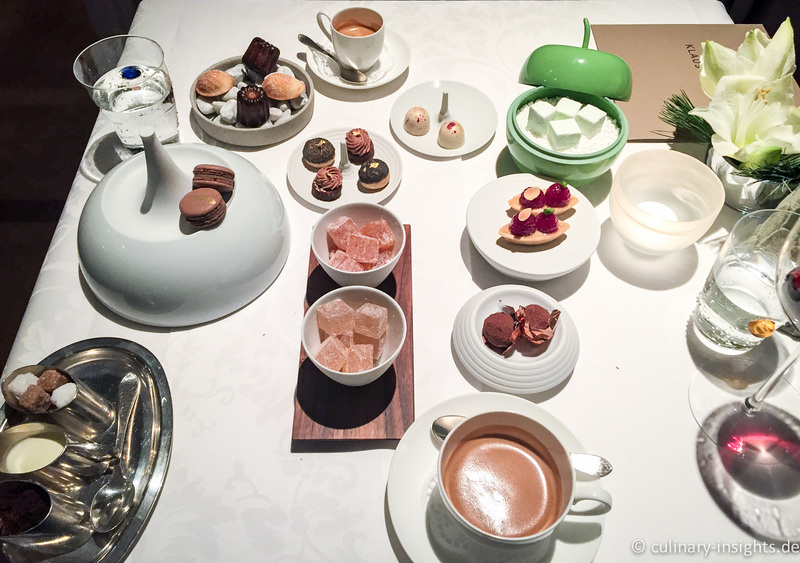 The last dessert seemed simple at first sight but then showed much complexity especially due its dialogue of coffee, chocolate and passion fruit – excellent (10/10). All said. Ran out of superlatives. Best products gently and impeccably prepared to just let them shine! Bravo, Mr Erfort! Needless to say, service was friendly, charmingly French, tres Pourchère – thanks to the whole team! 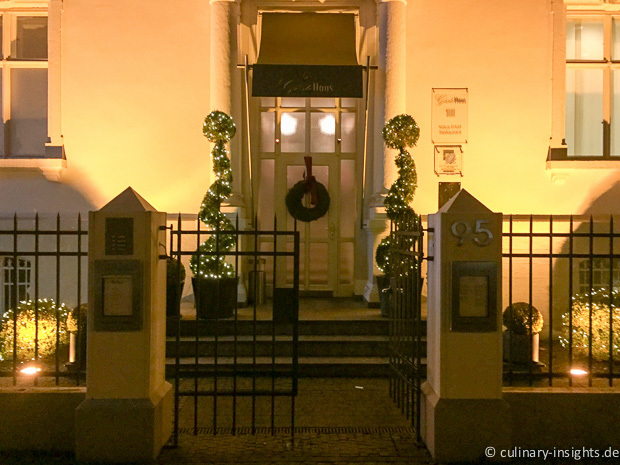 This entry was posted in Allgemein, Gästehaus Erfort and tagged Gästehaus Erfort, Jerôme Pourchère, Klaus Erfort, Saarbrücken, Three Star Michelin by IFS. Bookmark the permalink.